As an International Board Certified Master Hair Colorist with over 30 years of experience, Susan’s creative talent and vision will more than exceed your expectations. 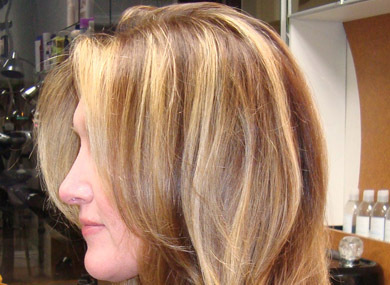 Specialties include corrective coloring, multi-tonal coloring and hi lighting. Modern cuts, as well as offering all Organic hair color services. Susan is full of energy and enjoys providing a positive and fun experience for her clients. In 1998 she was voted “Best Hairstylist” by the Fort Worth Weekly. Are you interested in organic hair color? In keeping with being “green”; I am using organic hair color on a growing number of clients. It is an alternative to standard hair coloring. More and more clients are asking for this specialty. Organic hair color is available for clients upon request. I use hair color products from Organic Salon Systems Organic Salon Systems and their plant based formulas are the most natural and organic professional hair color available today. Made with certified organic ingredients. There is no Ammonia, Parabens, Formaldehyde, plastics, SLS, or Thioglycoloates. It is 100% vegan. Furthermore, your hair is left shiny and silky by the coloring process. My organic hair care line is Onesta and they are also of the same quality of organic properties and are certified by PETA.